Let’s kick off our morning with some controversy, shall we? 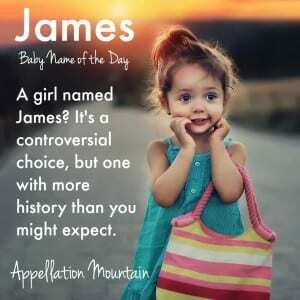 Thanks to Angela for suggesting our Baby Name of the Day: James. For a girl. James is a masculine staple. It’s Biblical, worn by saints and kings and men of distinction throughout the years. Many borrowed-from-the-boys names are newer possibilities, surname names or word names that can’t claim the pedigree of James. A girl named Ryan or River? Why not? But a girl named James is a surprise. Giacomina and Jacomina, from Iacomus, a Latin form of the Greek Iacobus. Jacobina and Jacobella, from alternate root Iacobus. Jacqueline, via Jacques, the French equivalent of James/Jacob. Etta James was born Jamesetta. Jamesina is sometimes seen, too. The go-to girl version appears to be Jamie, along the lines of Billie and Bobbie. In the late nineteenth and early twentieth centuries, a child named Jamie was probably a girl. Or maybe the feminine form was … James. Because here’s an interesting thing: the Social Security Administration indicates that women were named James in steady numbers from 1880 through the 1980s. Some of those could be errors, of course – hard-to-read handwriting, checking the wrong box. Except James ranked in the girls’ US Top 1000 every year from 1880 through 1989. 245 in 1955; 354 in 1970; 316 in 1982. That’s more than a few random errors. Jamie really caught on in the 1970s, boosted by The Bionic Woman and the popularity of the similar Amy. The unisex spelling used for The Bionic Woman – Jaime – skyrocketed to #29 for girls in the US in 1976, the year the television show debuted. Then came Mad About You, in 1992. 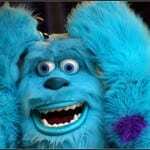 Jamie Buckman’s nickname? James. Early in her career, model-actress Jaime King was known as James – but she’s since given her nickname to her son, James Knight, and gone back to Jaime. Since James is a sometimes-surname, so isn’t unusual to meet a woman with the middle name, either a maiden name moved to the middle or a family name. James Marsden handed down his first name as a middle for daughter Mary in 2005. Sean Combs used it for his daughter born in 2006, Jessie, making for a lawless combo. Jessica Capshaw gave it to her daughter Poppy in 2012. That same year, Backstreet Boy AJ – Alexander James – McLean changed the spelling slightly when he welcomed daughter Ava Jaymes. Jennifer Love Hewitt used it for her daughter, Autumn’s, middle in 2013. Blake Lively and Ryan Reynolds welcomed their daughter in late 2014, but kept her name under wraps for months. When they finally revealed the name – James! – many reacted negatively. 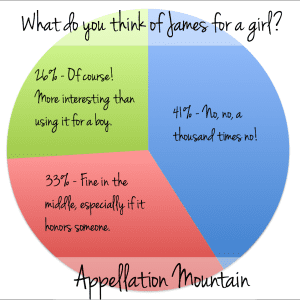 The site poll saw 41% of readers giving James for a girl a definite no. But tally up the other two responses. One-third said it’s fine in the middle. 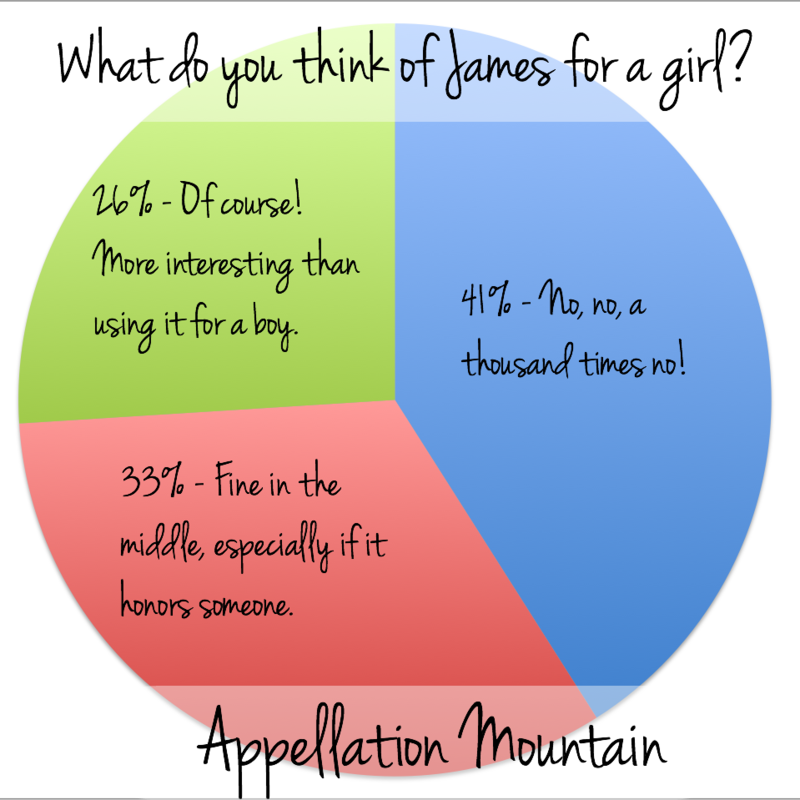 And 26% liked the idea of James as a girls’ name. This tracks with the usage numbers: 42 newborn girls called James in 2014, up from 28 in 2013. It makes me think that the Lively-Reynolds baby may inspire more parents to consider James a possibility for a daughter. Blake has since commented that it’s a family name, and since her name is traditionally masculine, it felt right to stick with the pattern for her own daughter. Here’s guessing that more and more families – maybe those who want to honor a loved one with the name – will see this as a more wearable possibility for a daughter. Especially given the nickname option Jamie, James for a girl seems likely to catch on. My first name is Raina, and my middle name is James in honor of my father. There’s something great about combining the hyper feminine and masculine – I have received so many compliments for having a “strong” sounding name. Fun fact: some people actually consider Jamie, the original spelling of Jaime, to be the slightly more masculine version of James. Jamie was used by the rough & tough Scotts, while James was used by the richer, more elegant English. Honestly I think this whole debate is rather pointless. Names shouldn’t have all these gender limitations. The name Darryl is both a boy and a girl name but it sounds masculine; it’s not limited to gender. Ashley is both a boy and a girl name but is sounds feminine; it’s not limited to gender. No name should be gender-limited. I think James is a wonderful name, male or female. 1996. Naming our girl Morgan was considered crazy. My husband wanted a strong name for our girl to give her an advantage someday. She’s now in her second year at the University of Pittsburgh studying microbiology. Strong girls need strong names! James is a great name whether a boy or girl. As my mother always said…a name is between the mother & the father and be damned anyone else! Blessings and good luck to sweet baby James! So, you are saying strong girls need boy names? Girl names are somehow weak? I know an Alejandra studying to be a doctor; I guess she missed the memo that she should be at home crying over her weakness. You can’t just look at a name and decide whether the person is strong or not. I love James for a boy or a girl! it reads as spunky and creative. I see a kid with gumption and a knack for adventure when I hear the name. James with the nn Jem or Jamie on a girl sounds delightful! Ditto this. Plus, as I’ve always said, until I can name my son Margaret or Katherine with no one batting an eye, stealing boy names for girls should be forbidden. 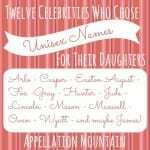 Boy-names-on-girls was my fave name category as a teenager, so I don’t have a visceral hatred for it, but I think some names definitely work better than others. I’m baffled by Dexter Dean, but Ryan or Dylan seem fine to me. With James I’m on the fence. It’s so masculine, but if I met a girl James I would probably think she was the coolest. Hello my name is Jaimes and I am a girl! I spell it Jaimes, and I love my name. I think it is unique and different then others.